Mars Food on College is a place I had previously written off. I had stopped in once, maybe a year ago, for a grilled cheese sandwich, only to be disappointed by an unremarkable single slice of American cheese smooshed between lacklustre bread. More recently, the outdoor sandwich board advertising lobster wraps or crab cake benny specials caught my attention. After a little more investigating, I was surprised to discover that the menu appears to be entirely new. As it turns out, changes have quietly been afoot over the last few months. 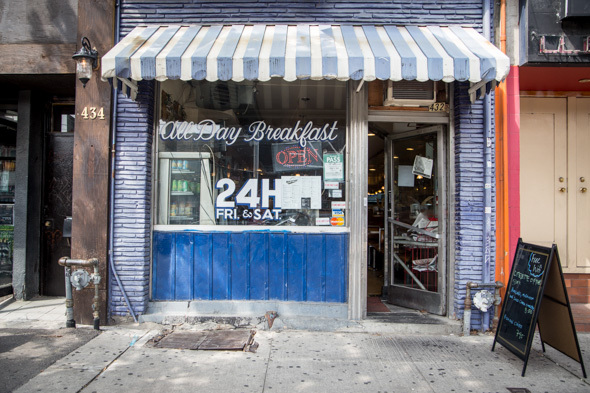 The diner, which opened in 1951 and has been operated by the Taecaris family since the mid-'80s, is now being helmed by Sathiyatharsan Arumugam, a red-seal chef. The patina'd interior remains entirely unchanged, as does the bran muffin recipe, which is still so popular, they're already sold out. 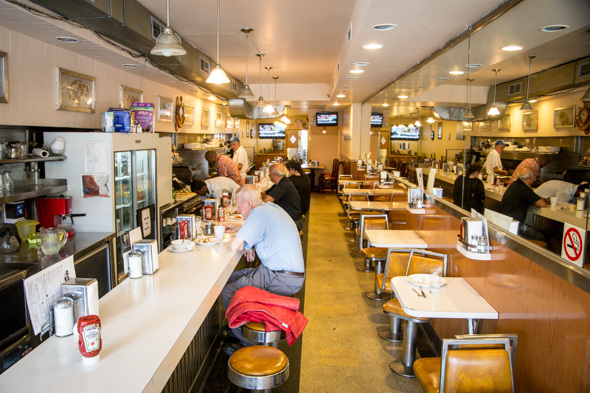 The original vinyl stools and chrome counter run down the length of the narrow 50-seat room, while faded photos and newpaper clippings a plastered around the cash register. There are no plans to reno - the updates start and end with the menu, which has been edited down and updated with a few new fresh options added to the all-day breakfasts, diner staples and bottomless cups of coffee. The grilled cheese ($5) is now offered with cheddar or Brie on challah, but today I opt for the chicken club ($9). 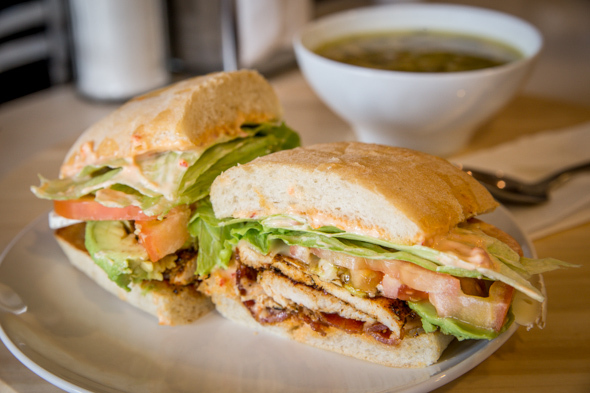 Built on a puffy, fresh herbed ciabatta bun, it's layered with peppery cajun chicken, brie, bacon, lettuce, tomato and a chipotle mayo. It comes with a choice of soup or salad; today's soup, a mushroom barley, is flavourful and peppered with a mix of mushrooms like cremini, porcini and oysters. 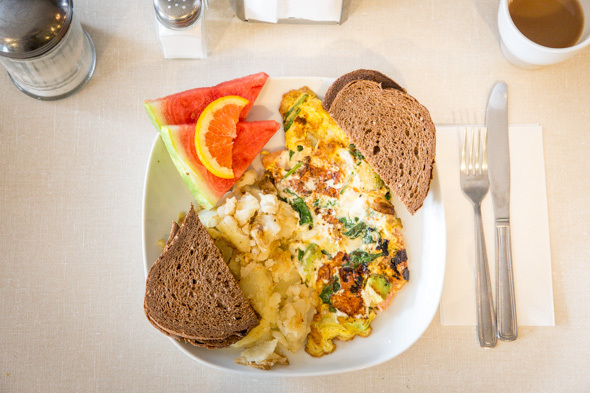 The omelette of the day ($8.50) is packed with fresh spinach, chunks of avocado, tomatoes, onions and goat cheese. It comes with potatoes which aren't quite fried enough, and are more like mash than breakfast hash. Dark rye on the side is a welcome option, though. The Mars combo platter ($10.55) arrives on a packed plate. It includes two eggs, any style, along with a slice of French toast and a buttermilk pancake topped with caramel sauce and sliced peaches. Fresh fruit - on today's visit, triangles of a watermelon - are included to help cut the grease. Bacon (or any of the other breakfasty meats) can be added for another $2. 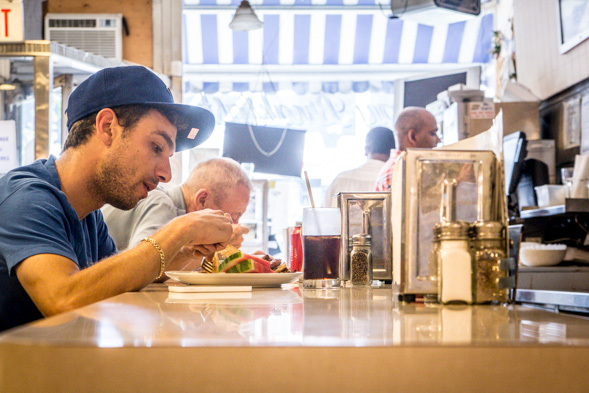 Currently, the diner is open from Monday to Sunday 7 a.m. to 6 p.m. Photos by Jesse Milns .